On Arrival at New Delhi Airport. You will met by our repersentative and transfer to the hotel. O/N stay at Hotel. Day 02: Delhi - Rishikesh (340 mts/1115 mts/230 kms/6-7hrs). Morning after breakfast drive (227 km) to reach Rishikesh. Stop at Haridwar for sightseeing of Ganga Ghats & Temples then proceed to Rishikesh. Arrive & check in at the hotel. Evening free to explore the area. Dinner and overnight stay at Hotel. Day 03: Rishikesh - Uttarkashi (170 kms/4-5 hrs). Morning after breakfast drive to Uttarkashi (1150 mt), which takes 5-6 hrs. Upon arrival check-in at hotel. After lunch visit NIM (Nehru Institute of Mountaineering) Institute & Museum. Evening free to explore the area. Dinner and overnight stay at the hotel. Day 04: Uttarkashi - Gangotri (3048 m/10,000 ft) Drive (95 kms/3-4 hrs). Morning after breakfast drive to reach Gangotri via Harsil (approx 25 km before Gangotri (3048 mt) by covering approx 95 km in 3-4 hrs. On arrival check-into Hotel/ Tourist Banglow. 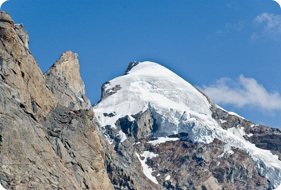 Day 05: Gangotri - Bhojbasa (3792 m/12440 ft) Trek (14 kms/5-6 hrs). Morning after early breakfast start first days trek to Bhojbasa following the river Bhagirathi on right bank by covering approx 14 kms. in 4-5 hrs. 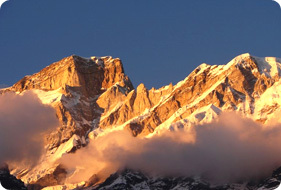 Trek is full of fascinating Himalayan sights and you can have beautiful views of snow clapped peaks around. Upon arrival at Bhojbasa, set up camp for overnight stay. Morning trek 4-5 hrs to reach the beautiful base of Bhagirathi group of peaks, Nandanvan. 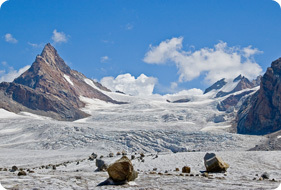 The trek crosses Gangotri Glacier. 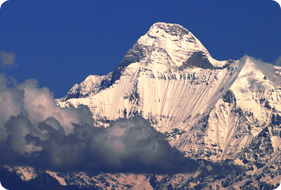 From here view the Shivling, Bhagirathi, Sudarshan, Thelu peaks and Kedardome. Overnight stay in tents. Mornings after breakfast start your trek (12 km) to Kalindi Pass (5947 mt). Spend some time at the spot and then trek down to Rajparav for dinner and overnight stay in the camp. which is 16 Km from Arwatal. Dinner and overnight stay in the camp. Morning after breakfast start trek to Badrinath situated on the bank of Alaknanda, standing like twin sentinels over the valley are the Nar and Naryana peaks, and in the distance soars the resplendent Neelkanth peak. A seven hrs walk brings you to Mana Village, the last village before the border, where you break for lunch. Later a 2 kms drive brings us to town of Badrinath. On arrival check into hotel. Afternoon visit the temple of Badrinath. Return to hotel for Dinner & Overnight. Evening transfer to the hardwar time to catch train for Delhi. On arrival met at the station and transfer to the hotel. O/N Stay at Hotel. Morning after breakfasts drive to Delhi (227 km). lunch enroute. Upon arrival at Delhi transfer to airport for onwards journey. ©2016 trekkingladakhzanskar.com All rights reserved.